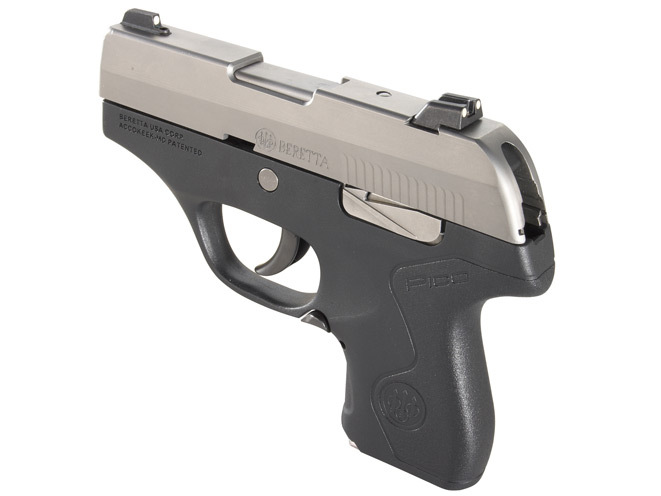 Pocket-friendly security ready to respond with fight-stopping firepower! Take your concealed carry up a notch with Beretta’s cutting-edge Nano in 9mm (back) and Pico in .380 ACP (front), which offer snag-free profiles, 6+1 capacities and more 21st century enhancements. Beretta has been in the business of satisfying the demands of military and civilian firearms customers for almost 500 years. That is a long time for a family-owned business, or any other business for that matter. 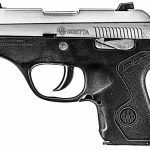 Firearms design has certainly changed over the years, and Beretta has not only kept up but also been a leader in innovation. 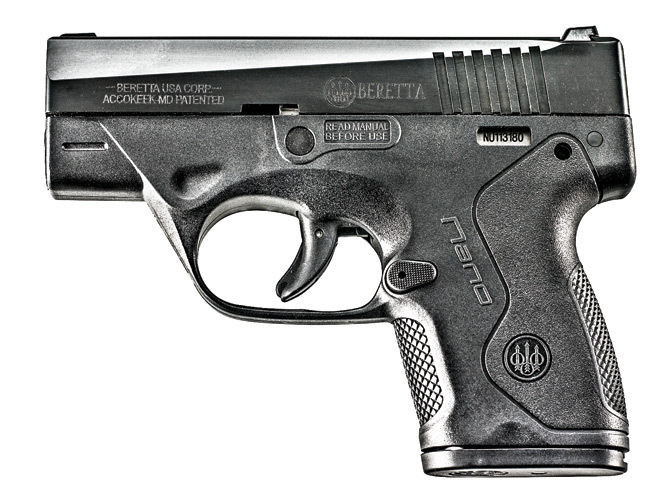 It was hardly a surprise when Beretta won what may be considered the most coveted handgun purchasing contract in the world. 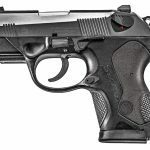 In 1985, the United States military selected the Beretta 92 as its official sidearm, renaming it the M9 and replacing the venerable .45-caliber Model 1911. 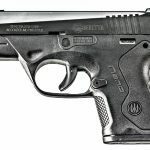 While military contracts have played a significant role in Beretta’s history, it has also been very much involved in the civilian market and made several small pocket pistols over the years. Today, the company caters to the needs of its concealed-carry customers with truly innovative designs using the latest in technological advancements and modern materials. In English, a “pico” is a mathematical term for “one-trillionth.” In other words, something very, very small. 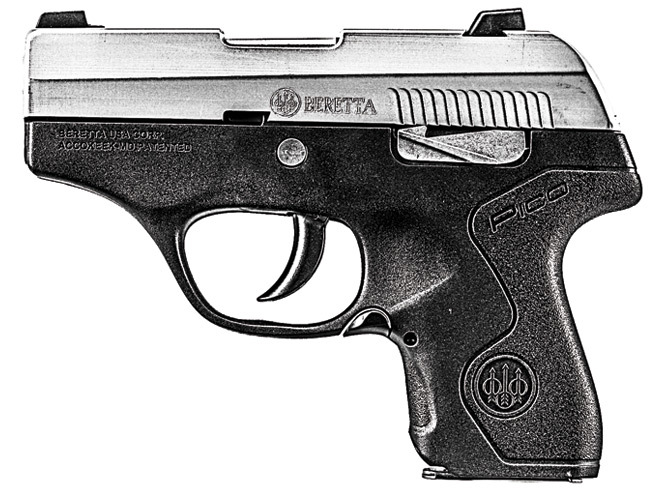 It is hardly surprising that Beretta chose this name for its new pocket pistol. 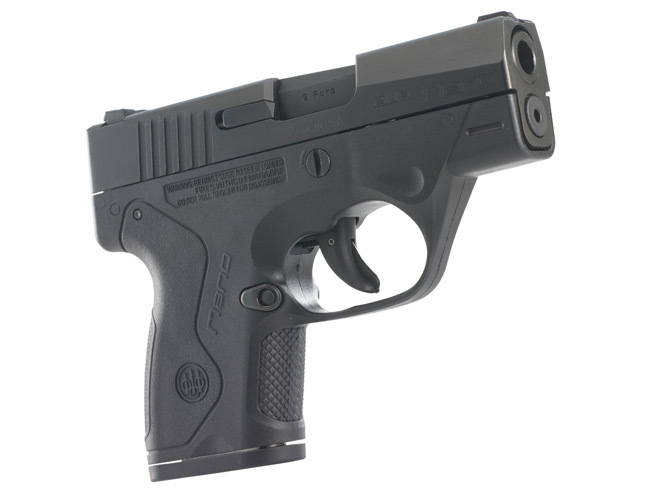 Despite the Pico’s extremely diminutive size, it is no mouse gun and is chambered for the .380 ACP cartridge. It is also loaded with extra features one would not expect to find in so small a package. 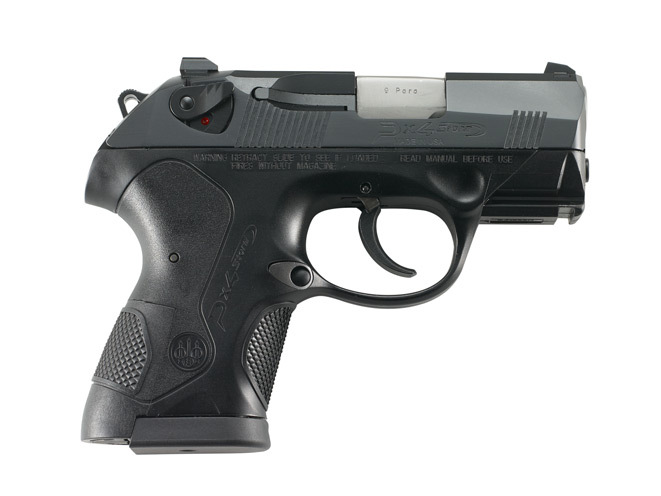 This double-action-only (DAO), hammer-fired pistol offers a six-round magazine and a lightweight polymer frame. 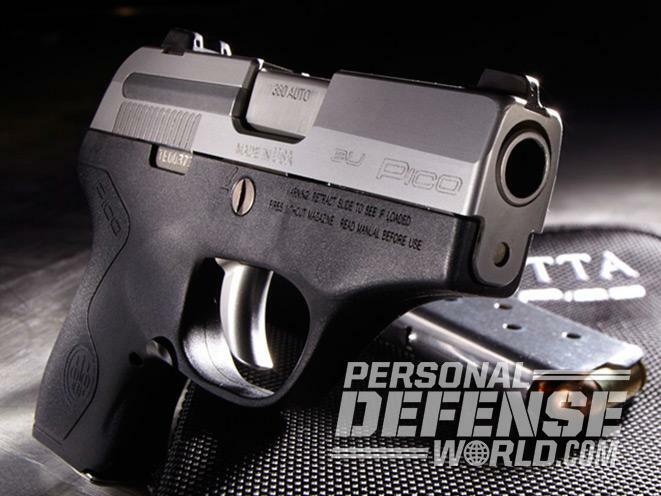 At less than 11.5 ounces, it is among the lightest pocket pistols you can buy. 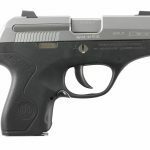 With an overall width of 0.72 inches, it is the thinnest pocket pistol available, and in-the-pocket width counts for a lot in terms of both comfort and concealability. 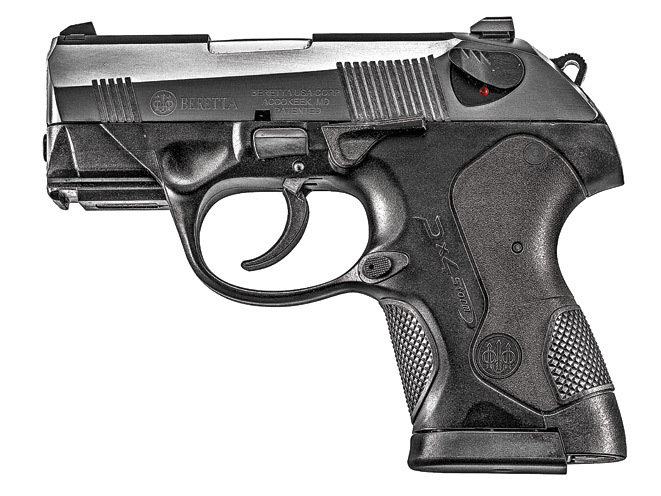 Beretta put a lot of thought into the gun’s design, and it features adadjustable and easily changeable three-dot sights (night sights are also an option), a functional slide release/lock and an ambidextrous magazine release. Most notable, however, is the modular design of the pistol, which allows the user to easily disassemble it and swap out barrels to convert the gun from a .380 to a .32 if so desired. The serialized chassis allows the user to remove the polymer frame and swap it out for one with a different color, one with an integral laser unit or an integral tactical light. Fit and finish on the samples I handled were excellent, and the gun has a smooth snag-free design so that it can be easily drawn from a pants or coat pocket. 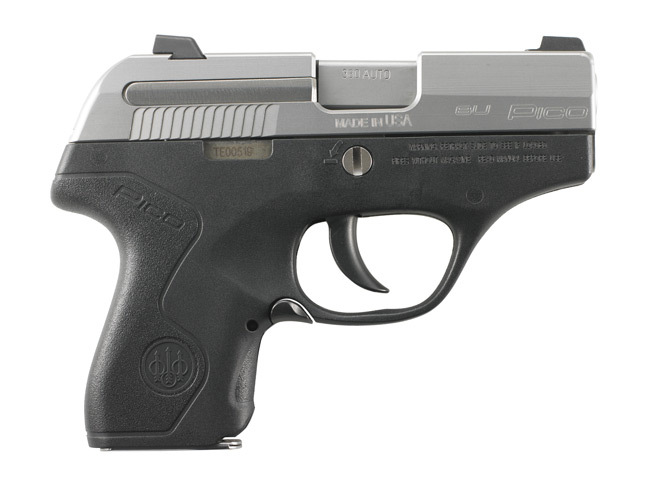 The crisp trigger features a 10-pound pull. While my test model featured a stainless trigger, current Picos have black triggers. The barrel mechanism has a minimal tilt design to improve reliability and help reduce recoil. This system allows defensive +P hollow-point ammunition to feed more reliably. When the action is pulled back, the tilt in the barrel is, in fact, barely noticeable. 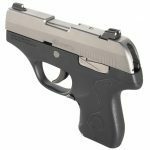 The Pico also stands out in that it ships in a carry case with two magazines, one of which has a finger grip extension for easier shooting and an improved hold. All of this plus the Beretta name and reputation for quality is available at a very reasonable cost. 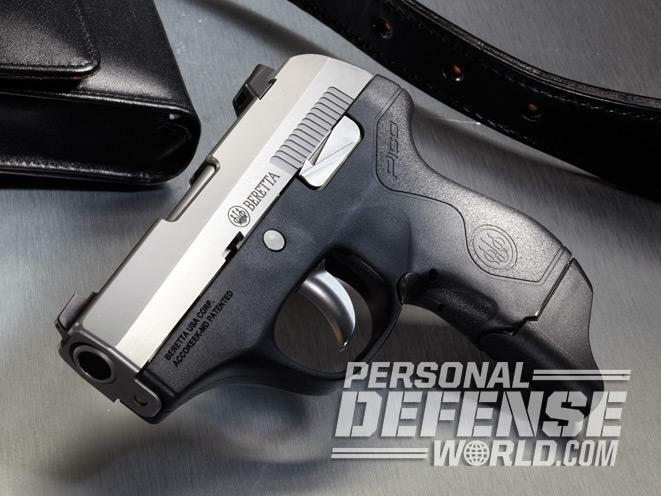 Pocket pistols are most often thought of as underpowered, but that does not have to be the case, especially when it comes to the Beretta Nano. 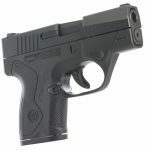 This 9mm, striker-fired subcompact, polymer-framed pistol offers a standard 6+1 capacity with an included extended eight-round magazine. My own preference is to carry with the flush-fit magazine and use the extended magazine as my spare carry mag. The super-slick design is less than an inch wide and 5.63 inches long with no external controls at all, other than the reversible magazine release and the trigger. The unloaded weight is less than 20 ounces, making the Nano ideal for all-day carry. The pistol features adjustable three-dot sights and a serialized chassis with an interchangeable grip frame. Several colors and options are available including standard black, pink and FDE. Both LaserMax and Crimson Trace lasers are available. 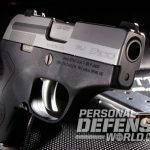 Just because you want a pocket pistol doesn’t mean you have to completely sacrifice capacity or power. 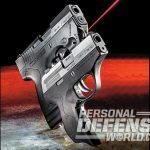 The Beretta PX4 Storm Subcompact may be pushing the boundaries of what can be considered a pocket pistol, but it leaves nothing behind in term of features and performance. Available in a 13+1 capacity 9mm or a 10+1 capacity .40, this hammer-fired, double-action/single-action (DA/SA) pistol stays small but includes an accessory rail for compact lights/lasers, three-dot adjustable sights, an ambidextrous thumb safety, a reversible magazine release, a full-sized slide lock/release and a polymer frame with interchangeable backstraps. This pistol also features a recoil-mitigating tilt breech system, making it one of the most comfortable to shoot subcompacts available. 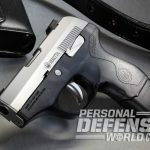 Beretta continues to innovate new products in the pocket pistol category, but traditionalists also have access to the company’s older and still highly effective designs. Every day, more and more people secure concealed-carry permits and choose to prepare themselves for self-defense inside and outside the home. At last count, over 11 million people had concealed-carry permits, and this market is increasingly including women gun owners. 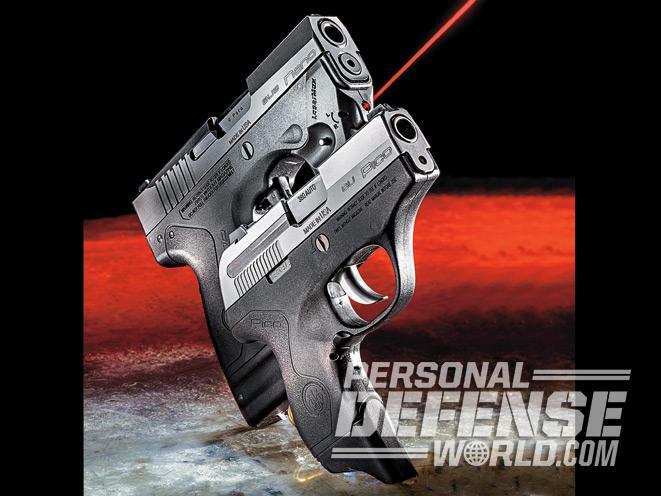 Small, concealable and easy-to-shoot pocket pistols are not going away any time soon, and with improvements in firearms and ammunition design they are becoming much more effective than they ever were before. 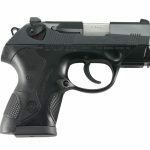 For more, visit http://www.berettausa.com or call 800-929-2901. 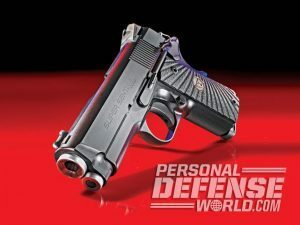 Street-ready 1911 compacts offering high-powered protection from 9mm to .45 ACP!